BOSTON — A lot of people love Christine Gentry. "I wouldn't be here without her," said Henrietta Oparah. "She's numero uno for me. "\Gentry made a decision last year that saved not only Oparah, but also 27 other people, all waiting desperately for a new kidney. 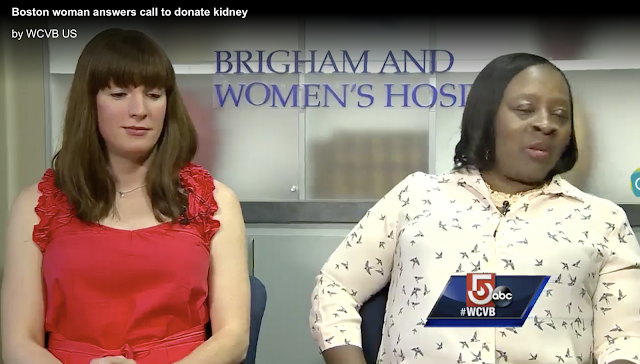 Oparah remembers getting the call from Brigham and Women's Hospital in Boston. "She said, 'You have a kidney,'" Oparah recalled. "She said, 'You have almost the perfect match.' And I just burst out crying." The kidney that Oparah received was the last organ donated in the third-longest chain of kidney transplants in the world. And it all started with Gentry. "They almost always need someone like me -- a good Samaritan donor -- to kick it off," she said. In Massachusetts right now, there are 2,265 people waiting for a kidney. Nationally, the list has 97,393 names.